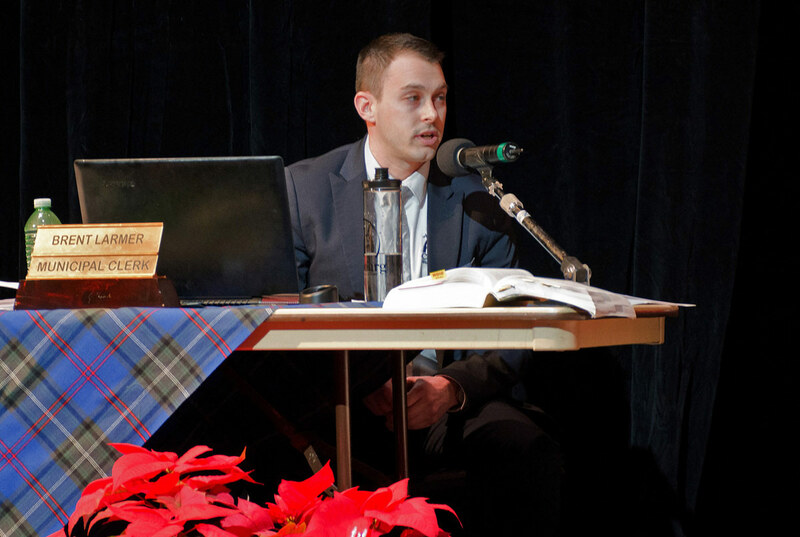 The new Cobourg Council held their first public meeting Monday evening in the Concert hall at Victoria Hall. The unusual location was chosen to accommodate the expected crowd but only about 50 showed up. 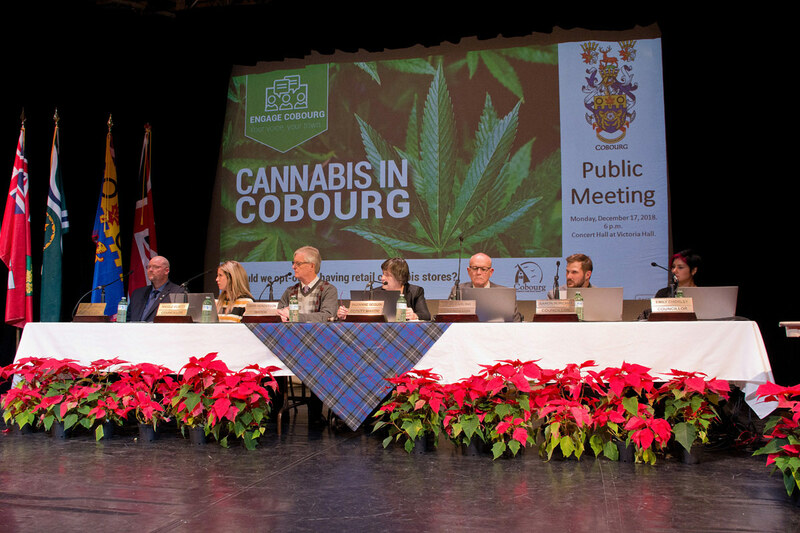 The meeting was to engage with the public on whether Cobourg should opt-in and allow retail Cannabis stores in Cobourg although it seems that initially only 25 will be licensed in all of Ontario. The meeting was chaired by Deputy Mayor Suzanne Séguin and started with speakers giving information on the issue and its impact. Town Clerk Brent Larmer gave background information (as provided in an earlier post), Ashley Purdy talked about the engagement with the public, Deputy Police Chief Paul Vandegraaf gave the Police perspective and Catherine MacDonald spoke about health issues. The information provided was not much different than provided in the written reports as given in the previous post. Ashley Purdy said that the total number of participants in the online survey was now over 3400. In response to a later question from Adam Bureau, she said that although people could find ways to vote more than once, it was possible to delete extra votes using additional information collected on voters (using IP addresses). As of Dec 18 at 11:30 am, of 4000 respondents, 67% want to opt-in. For the first weeks of the survey it was consistently 80% opt-in but over the last few days the number of participants is rising fast and the opt-in numbers are going down. Makes me wonder if there’s a special interest group trying to change the results. However, this survey is only one of the inputs. 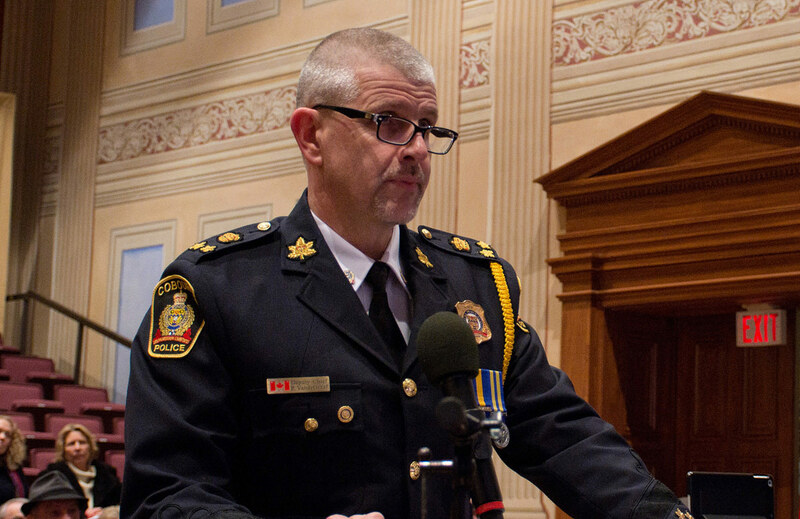 Paul Vandegraaf gave a lot of details on the impact on the Police of the change in the law but said that he believed that the Cobourg Police were ready and that it would have little impact. The Police were now trained on using the “Standard Field Sobriety Test” (SFST) to check drivers but did not expect any noticeable difference in work load. He said that they would need a search warrant to check if people were growing more than the allowed 4 plants each. See his full presentation in the links below. Catherine MacDonald from the Halliburton Kawartha Pine Ridge District Health Unit spoke about health issues – the impression she left was that using cannabis was mostly not good – especially for anyone under 25. Maria who with her husband operates the Ecig Flavourium (Vaping products), was the most passionate and detailed in her support. She likened selling cannabis to selling vaping products and said that regulations will ensure there are no problems. She gave examples where marijuana had helped with medical issues – notably PTSD. 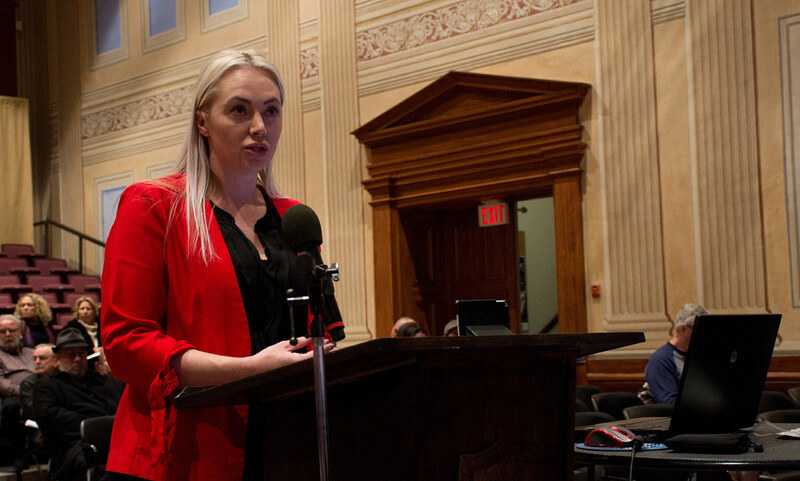 She suggested there should be an advisory board of independent citizens and complained about Police inaction on 7 instances of illegal marijuana activity. Other speakers supporting Opting-in mentioned that we already have a cannabis plant here, that it’s arguably no more dangerous than alcohol or tobacco, that it’s useful in treating PTSD/Shellshock and that concern about being located near schools seemed unnecessary given that we have an LCBO store near the William Academy. One citizen mentioned that legal stores help with education which is sorely needed and provide safe access. Of the two opposing speakers, Gerry Bourne said that stores did not need to be in Cobourg – “they can be found elsewhere” – and that they would attract the “wrong people” although I think he admitted to being a user. He also pointed out that if Cobourg Opted-out, they would benefit from the experience of others and could opt-in later if needed. Warren McCarthy was not actually against so much as undecided. He wanted a “maybe” decision. He asked Councillors to each give their position but chair Suzanne Séguin said that that would be available when Councillors debated the issue at the next Council meeting. In summary, Mayor John Henderson repeated that the issue would be debated at the Committee of the Whole meeting on January 7 and a final decision would be made at the regular Council meeting on January 14. He also said that we can expect more Public meetings using the Concert hall to provide extra audience space – especially for major issues. The online survey would remain open until January 2. All 7 presentations are available online (video – not printed) – see the Facebook video of the meeting here. A tourist town without a pot shop? Seriously? For decades the criminal class was able to satisfy Canada’s cannabis needs and profit from it. In spite of the ‘war on drugs’ (another govt failure), the criminals made sure a supply of weed was available for purchase, in some cases, with free delivery or drive-by pick-up. So Justin blames the local municipal gov’ts for thwarting his roll-out plans. He also claims he will build a pipeline with our money ——— someday, maybe, uh, duh. Cobourg’s FSD Pharma Inc. has completed a ‘strategic investment’ of $1.3 million or just under 9.9% in Huge Shops, a Toronto-based cannabis retailer. Huge Shops has a strategic alliance with Chairman’s Brands, parent company of Coffee Time, a well-established operator of retail coffee shops with more than 75 locations in Canada and other locations worldwide. As part of the investment, Huge Shops has the option to acquire a minimum of ten retail locations under Chairman’s umbrella of properties, and, subject to availability and further negotiation, purchase additional Coffee Time sites. Huge Shops has identified ten initial key locations across Ontario, which meet the company’s strategic objective to become a premiere recreational cannabis supplier. Whew! Good news. Real news also. Ben would have had us believe that it is a government “monopoly”. There are people of all stripes who arrive at the beach. Some give off unpleasant odours. Reasons can be poor personal hygiene, smoking tobacco, smoking cannabis, poor oral health, heaven forbid that a tourist or town citizen has trimethylaminuria, would we need to block all these individuals because their odour(s) may offend? Scents will still be there to regale our olfactory senses, retail pot stores available or not. I arrived very early expecting seating to be at a premium. To see the audience not make 50 people was disappointing. The opposition was next to nothing. Even more interesting to me was during the presentation for and against listing health issues. If I had closed my eyes and listened not knowing the subject that was behind discussed I would have guessed the topic was alcohol. As I stated at the meeting in support of a previous presenter that Cobourg refusing a retail plan while endorsing the grow op and freely accepting their taxes makes no sense. Agree with Cam – good meeting. My hope is that are more of these sessions. Thought Councilor Sequin did a good job chairing the meeting, group. Comments on the input from presenters: 1) John is correct that Maria took Polices Services to task for not responding to illegal pot activity. My takeaway is that we can’t get lazy about this, all of us, public & police, need to ensure all is above board. 2) After the meeting I asked Catherine MacDonald about the impact to NHH, her response was that there would be probably a spike in emerg activity but felt that it would level off. 3) Though I voted to Opt-In I like the points that Gerry Bourne made: ‘wrong people’ (particularly around the beach – my words), reek of pot (my words), learn from the experiences of others. We don’t have to be early adopters – as the Town Clerk confirmed once we Opt-In there is no Opt-out provision. Oh a Police Services dream – more money, this time to kill the black market. What makes the average person think they can do it now when few ‘pot’ convictions have been seen in the last few years. Have we seen any “Mr Bigs” go down – Noooo, only the sad users with stuff in their pockets. I for one am not in favour of having the Police do Mr Ford’s dirty work just to protect a government monopoly! What govt monopoly? The dispensaries in Alderville are not government owned. The dispensary for our own town producer will not be govt owned. I respect the police for asserting their priorities that there are far more serious crimes to respond to, rather than “illegal pot activity”. Enforcement of the pot laws caused far more damage to young people over the decades, than the consumption of a mild euphoriant. Our Health Unit’s tactic in adopting full-out Reefer Madness is at once laughable and pathetic. Predicting “a spike in emerg. activity” is beyond the pale; on what evidence is this based? Hospital statistics collected over time that document marijuana overdose cases? Or just their gut feelings? Regular smokers of weed are laughing at them – or are angry with their clumsy attempts to instill fear among the uninitiated. The real problem with drugs is the opioid crisis. The Health Unit’s time would be better spent on finding effective strategies to combat that scourage that is ravishing people from one end of the country to the other. As we used to say – GET REAL! We also used to say RIGHT ON! The 25 licences will be doled out under a lottery run by the Alcohol and GamingSeven of those Commission of Ontario (AGCO). Municipalities with populations under 50,000 can’t enter the lottery. But keeping meeting and how about being inclusive – meetings in French, Ojibway and Cantonese? Walter, perhaps this is a golden opportunity for the town to ‘demonstrate’ their commitment to openess and public engagement without the risk of having it blow up in their face. Let’s wait and see how they do when some serious chips are on the table as the term develops and we see the MO of this administration with respect to public input when it actually means something. Call me sceptical but time will tell. I think this is just a bit of showmanship by an untested and neophyte council putting on a face of sorts, and taking it the extra mile while the opportunity lasts. I must have been unclear in my obtuse way and sloppy choice of words, and unintentionally condescending, no less. I can see how you drew your conclusions. While I do think this issue is an opportunity for this untested Coucil, as a body, to experiment, I too hope that openness and transparency will flourish with this neophyte council. As is so often said in the investment world, “past performance is not an indication of future results” and that may be applicable in other instances, including politics. My intent was to express my reservations about making assumptions so early on and that my mind is wide open as to what lies ahead. I certainly hope for a successful term as well, and…time will tell. Thanks for your critique which prompted me to clarify my comment. Attendance at the meeting (50) combined with the balance of the pesentations (5-2 in favour of opting in) and the poll (3-1 in favour) suggests to me that council has received sufficient input. Good meeting. Excellent presenters. out of town if we don’t keep apace with demand . Same old encore une fois all over again. How many more of these meetings do we need? Tell us about the enormous harm being done to the community by these meetings.